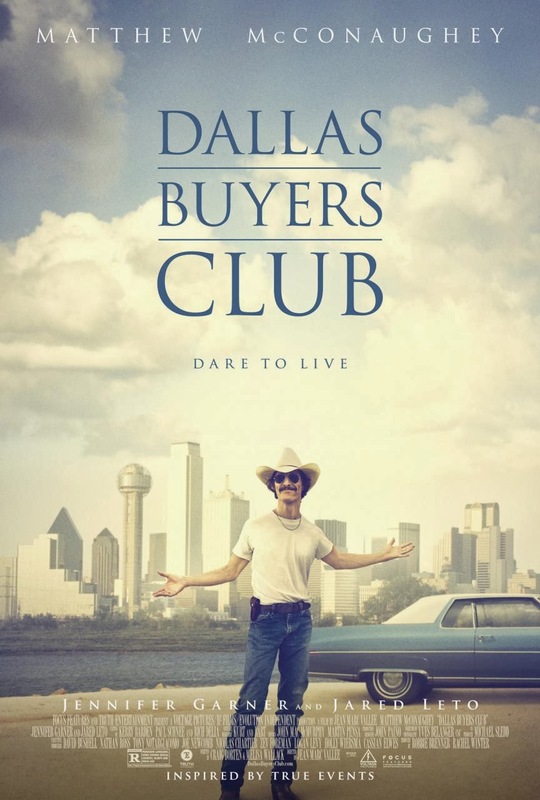 Dallas Buyer's Club tells the story of Ron Woodroof, the real life man who was diagnosed with HIV in the 1980s. He became part of a buyer's club, or an organisation distributing unlicensed medicine among members for treatment of their illness. In the film, having tried conventional FDA approved medication, Ron finds it doesn't help his condition, prompting him to find alternative means of surviving longer. Once he discovers the benefits of alternative drugs in Mexico, he sets about fighting to make these more widely available in the USA. Matthew McConaughey has been gracing our screens lately in the fantastically well written True Detective (seriously, this is a brilliant series), alongside Woody Harrelson, where he excels as the obsessive detective on the trail of a brutal killer. While there is little to fault in his portrayal of Ron, I'm not so sure he deserves to win the Oscar for Best Actor (still rooting for Chiwetel). Maybe I've just been spoiled by McConaughey's other performances, but it's also to do with the limitations of the script. There has been criticism levied at the film for it's too neat 'from homophobe to acceptance' narrative (this article exposes some of the fables of the film), and arguably, there are unnecessary aspects added to the story (do we really need a love interest with his doctor?). The script is reasonably predictable, though it doesn't fall into the category of overly sentimental, which is a relief. Jared Leto is actually very good in his supporting role of Rayon, and we even have a glimpse of the darker side of AIDs through his decline in health, but there is a disappointing lack of emphasis on how the illness affected gay men. Sure, we know it's not a disease that exclusively effects gay men, but a story with a greater emphasis on that would have been more representative of the times. I know I sound like I'm really down on this film, but I'm not. It's good, it's just not challenging enough.